Performers include: Richard Belzar, Yaphet Kotto, Clark Johnson, Kyle Secor, Andre Braugher, Melissa Leo, Reed Diamond, Sharon Ziman, Peter Gerety, Jon Seda, Toni Louis, Callie Thorne, Isabella Hoffman, Max Perlich, Clayton LeBouef, Zeljko Ivanek, Ned Beatty, Michael Forbes, Daniel Baldwin, Ralph Tabakin, Judy Thornton, Giancarlo Esposito, Michael Michele, Harlee McBride, Walt McPherson, Ami Brabson, Kristin Rohde, Jay Spadaro, Herb Levinson, Ellen McElduff, Rhonda Overby, Jon Polito, Gary D’Addario, Gerald F. Gough. A gritty crime drama based on David Simon’s nonfiction book and set on the streets of Baltimore. The series gives viewers a no-nonsense look into the bleak lives of inner-city detectives and their cases. 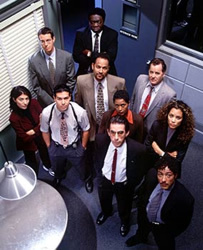 Characters include Detectives Beau Felton (Daniel Baldwin), Stanley Bolander (Ned Beatty), John Munch (Richard Belzer), Frank Pembleton (Andre Braugher), Meldrick Lewis (Clark Johnson), Al Giardello (Yaphet Kotto), Kay Howard (Melissa Leo), Steve Crosetti (Jon Polito), Tim Bayliss (Kyle Secor), Mike Kellerman (Reed Diamond), and Stuart Gharty (Peter Gerety).